This is the thirty-first post in the Around the World Birthday Extravaganza Series. Please scroll to the bottom to see all the other posts in this series. It had been my goal for years to visit this cute Totoro-themed cafe and try its signature Totoro cream puff. It’s the only cafe that has the licensed rights to make all of these Totoro-themed desserts (call it the “official” Totoro Cafe). The cafe is owned by Hayao Miyazaki’s sister-in law. Hayao Miyazaki is the founder of Studio Ghibli and creator of My Neighbor Totoro along with many other well-known movies. I was so excited to finally be able to set aside the time to make the 30-40 minute journey from my hotel to this quaint little cafe off the beaten path. The cafe is a bit on the outskirts of Tokyo. You can take either the Odakyu or Keio-Inokashira line, both of which take you within walking distance of the cafe. As you walk even closer, it becomes pretty evident you are at the right place! This totally looks like the type of place where Totoro would live. And the cafe is OPEN! Once you enter, Totoro themed things are everywhere. It is a dream-come-true for any Totoro lover. I could not stop taking photos. While you are standing in line, you can browse all the Totoro themed things they sell, like Totoro-shaped butter cookies (yep, I caved and bought a pack). 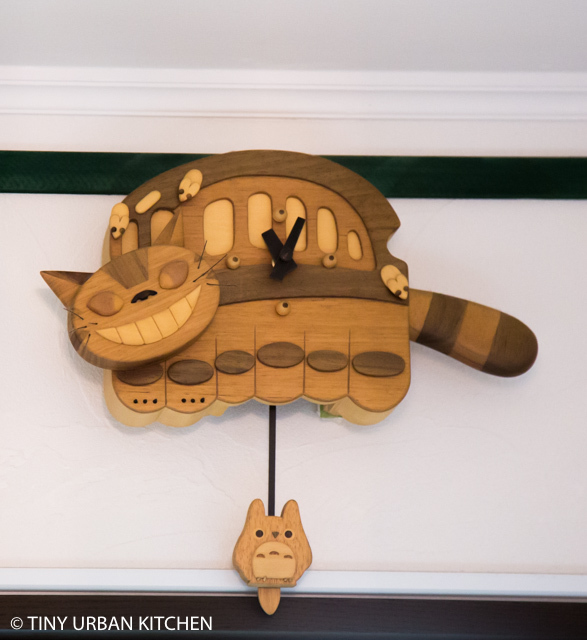 Once you reach the line, you can order Totoro cream puffs to go. Each different colored leaf or head “topping” represents a different flavor. You can see the bakery in the back. Check out the freshly baked not-yet-decorated Totoros. And these are getting filled with cream and topped with hats! Hee hee, even the change tray has a mini Totoro cream puff on it. And this clock! I wish I could take it home with me . . . There are even some original Miyazaki drawings on the wall. Ha ha, why does Totoro look so mad? Is he eating with chopsticks??! Endless Totoro things to look at . . . I love this corner. It consists of all different types of handmade Totoro things, like origami and needlefelting. Kind of reminds me of when I was making all sort of Totoro things. When we got to the counter and said we wanted to eat the cream puffs at the cafe, they told us that we couldn’t order the “eat-in” cream puffs at the bakery. So, we got out of line and went up the stairs. Thankfully since it was early (probably around 11AM), we got a seat no problem. In fact, we got this awesome outdoor seat which was very cool. We were planning on having lunch elsewhere, so we just ordered some espresso drinks and two cream puffs (!). This is vanilla cream puff Totoro. This is chestnut cream puff Totoro. Ahh! It was so hard to pull them apart. I must confess that the section around the ear was a bit dry (I guess it needs to be hard and dry to stay up! ), but the rest of the cream puff was pretty good – not too sweet! It was very fun to come and finally make the pilgrimage to this cute little cafe. It’s in a lovely, off-the-beaten-path area of Tokyo and takes a bit of effort to visit. If you’re a Totoro fan this is a must-visit type of place. If you’re not, well, the food is fine, but there are probably lots of excellent bakeries in Tokyo that also serve similar quality cream puffs. The reason to come here, of course, is the full immersion into the Totoro experience.